After many years of research there is growing evidence that SIDS is more likely to be a consequence of a wide range of infant and environmental interactions than due to one particular cause. Head covering may be part of a chain of events for some of these deaths and suggested causal mechanisms include mechanical occlusion of the airways, rebreathing of expired air (both of which could lead to hypoxia or hypercapnoea) and thermal stress (leading to generalised or localised hyperthermia). This is a systematic review of the prevalence of head covering among victims of SIDS and age-matched control infants and an evaluation of how far the associated risk agrees with the epidemiological evidence. We have attempted to follow the MOOSE guidelines for systematic reviews.6 Customised databases at both collaborating research centres were utilised along with PubMed, which includes Medline and Old Medline citations. The primary search used the term SIDS with words describing the risk factor (“head”, “cover” or “bedclothes”) or using the generic term “risk factor” for different study designs (“case-control”, “cohort”, “case-series”, “review”). A secondary search of all the references from the relevant papers was also conducted. Potential studies written in languages other than English were included and read for any reference to head covering. Attempts to gain access to unpublished data were made at international conferences within this field and members of the International Society for the Study and Prevention of Infant Death (ISPID), who come from many different countries, were asked if there were additional studies we had not identified. Authors of included studies were contacted if specific numerators or denominators were missing from the published manuscripts. Over 600 papers were identified along with more than 100 epidemiological investigations. Pre-existing criteria were used for inclusion in the meta-analysis: head covering had to be reported, distinct from other forms of facial occlusion and analysed across the study population, and the study had to be controlled with observations of age-matched infants and conducted between January 1950 and May 2007. The prevalence of head covering among SIDS victims (table 1) in each study varied from 13% to 48% with a pooled mean prevalence of 24.6% (95% CI 22.3% to 27.1%). The three earliest studies conducted before the major decline in the SIDS rates27–29 reported a higher prevalence of 36.1% (95% CI 30.9% to 41.8%), although head covering remained a consistent feature in subsequent studies with a mean prevalence of 21.0% (95% CI 18.5% to 23.7%). Among the control infants the prevalence of head covering after the reference sleep was much lower, ranging from 0% to 6% with a pooled mean prevalence of 3.2% (95% CI 2.7% to 3.8%). A test for heterogeneity of the odds ratios between studies suggests the risk associated with head covering was significantly different (p<0.01), although this was in strength rather than direction; the univariate odds ratio varied between two-fold and almost 50-fold but denoted a significant risk in all of the studies (fig 1). The pooled univariate estimate was 9.6 (95% CI 7.9 to 11.7). In seven of the 10 studies the odds ratios for head covering were adjusted for other factors associated with SIDS (all but one of these studies were conducted after the dramatic fall in SIDS rates). The number of adjusted factors and how these were defined varied between studies (see footnote in table 1), but the multivariate risk estimates for head covering remained highly significant in each investigation (fig 2). The pooled adjusted odds ratio was 16.9 (95% CI 12.6 to 22.7). Assuming that head covering is causally related to SIDS, the data from these studies suggest the population attributable risk would be 27.1% (95% CI 24.7% to 29.4%). Figure 1 Forest plot of unadjusted odds ratio (and 95% CI) for infants found with head covered by bedclothes after last sleep. Figure 2 Forest plot of adjusted odds ratio (and 95% CI) for infants found with head covered by bedclothes after last sleep. Four studies21 24 33 37 also included questions to the parents regarding whether their infant had ever been found previously with bedclothes covering the face or head (table 2). Over a quarter of SIDS and control parents responded that this had occurred at least once prior to the death or reference sleep (26% SIDS vs 27% controls), although for both sets of infants head covering was not described as a common event. The pooled univariate odds ratio for the four studies was 1.0 (95% CI 0.8 to 1.3), while the pooled adjusted odds ratio from just two studies was 1.1 (95% CI 0.9 to 1.4), suggesting no difference in previous instances of head covering between the two groups (fig 3). Figure 3 Forest plot of unadjusted odds ratio (and 95% CI) for infants ever previously found with head covered by bedclothes. Home studies of healthy infants in New Zealand with overnight video and physiological recordings showed that head covering was more common during sleep among bed-sharing infants than those sleeping alone in a cot, but also that parents tended to adjust the infant covering during the night.42 Data from the UK48 suggest that fewer co-sleeping SIDS infants were discovered head covered (7% vs 19% among solitary sleeping SIDS infants), a finding confirmed by a more recent study in Scotland16 where of 46 SIDS infants sharing the parental bed only three (7%) were found with their head covered. Data from the Scottish study also suggested that previously reported episodes of head covering were less common among both co-sleeping SIDS infants (13%) and controls (20%) compared to the results we report in table 2. This reduced prevalence may indicate a protective effect from the parental presence; a more recent analysis of the UK data suggests twice as many SIDS infants were discovered with the bedclothes covering the head either outside the parental bedroom during the night-time sleep or unsupervised in a room during the day-time sleep.49 Despite these observations bed sharing, particularly among parents who smoke, is strongly associated with SIDS and it would be dangerous to recommend bed sharing as a strategy to reduce the prevalence of head covering. The prevalence of head covering among studies conducted after the fall in SIDS rates suggests that a fifth of SIDS infants are still being discovered with bedclothes covering the face or head. The initial “Back to Sleep” intervention campaign conducted in the UK in 1991 included advice for parents to avoid infant head covering, but this seems to have had far less impact than the campaign’s main message regarding infant sleeping position. The pooled adjusted estimate suggests an almost 17-fold increased risk associated with head covering, five times higher than pooled estimates for prone sleeping50 and maternal smoking51 and eight times higher than estimates for other potential risk factors such as bed sharing,52 bottle feeding53 and infants not being given a pacifier.54 This pooled estimate should be treated with caution because of the lack of homogeneity among the reported odds ratios. There are too few studies to meaningfully explore the differences in estimated risk, but the strength of the findings, all in one direction, suggest the risk associated with head covering is extremely high. The epidemiological evidence does not give credence to the idea that head covering is just part of a terminal event but neither is it wholly supportive of the currently proposed causal mechanisms. The lack of consensus as to why head covering may put a vulnerable infant at risk is equally applicable to arguments surrounding prone sleeping and perhaps reflects both our limited understanding of infant physiology and the current scarcity of more sensitive or specific pathological investigations. Some SIDS victims are found with their heads covered by bedclothes, but it is not clear whether this is just a consequence of the terminal event or a contributory factor to the death involving potential mechanisms such as hypoxia, hypercapnoea or thermal stress. The risk associated with head covering has consistently been significant across studies: a quarter of SIDS infants are found with their head under the bedclothes, an eightfold difference compared to age-matched controls. The epidemiology of SIDS does not fully support one particular causal chain but neither does it suggest that head covering is just part of some agonal event. If the relationship is causal, approximately one quarter of SIDS deaths might be prevented if head covering was avoided. Another potential mechanism of causality involves heat stress. Excessive clothing and bedding, warmer rooms, reduced ventilation and infections are all associated with SIDS deaths. A history of profuse sweating has been reported among SIDS victims,63–65 although the patho-physiological basis for heat stress in SIDS remains to be determined. The infant head is the site of 40% of heat production and for an infant up to 85% of total heat loss is through the face or head. Covers rising up over the head could therefore result in acute thermal imbalance with a rise in brain temperature not necessarily accompanied by a rise in body temperature.66 Franco et al have shown among healthy sleeping infants that covering of the infant’s face with a bed sheet, although associated with only mild increases in body temperature, induces significant changes in cardio-respiratory and autonomic parameters.67 In the study by Kleemann et al28 head covered infants tended to show signs of profuse sweating, an association also reported by Carpenter et al,31 which agrees with the interaction found by L’Hoir et al of head covered infants found under duvets35 which may be more permeable57 but have greater heat insulation than conventional covers. Thicker covers are commonly used more often during the colder months, but incongruous to all these findings is the fact that the winter peaks of SIDS deaths have substantially diminished at a time when the prevalence of head covered SIDS infants is still quite high. In the UK the “Feet to Foot” campaign, advising parents to place the feet of the infant at the foot of the cot to prevent head covering, was launched by the Foundation for the Study of Infant Death in 1997 and has subsequently been endorsed by the American Academy of Pediatrics (AAP).68 Although this advice seems intuitively sensible there is, as yet, no published evidence available that this practice reduces the risk of head covering or lowers the risk of SIDS.69 Findings from the study by L’Hoir et al35 suggest that a lightweight cotton sleeping sack (“trappelzak”) used by the majority of Dutch parents may be protective against SIDS both in terms of preventing the infant from turning prone and avoiding head covering. Further evidence than just this one study may be needed but such a practice deserves closer scrutiny given the continued low SIDS rates in Holland. The population attributable risk suggests that more that a quarter of SIDS deaths might be avoided if the possibility of infant head covering were eliminated. Similar to the prone sleeping position, head covering is a modifiable risk factor with a potential for further reducing SIDS deaths despite a lack of a complete explanation for the causal mechanism involved. Dr Peter Blair is funded by the Foundation for the Study of Infant death (FSID) in the UK and Professor Edwin Mitchell is supported by the Child Health Research Foundation in New Zealand.
. Time changes in the mortality from accidental mechanical suffocation among infants under 1 year old in different geographic regions of the United States. Public Health Rep 1936;51:1641–7.
. Accidental mechanical suffocation in infants. J Pediatr 1944;25:404–13.
. Accidental infant suffocation. BMJ 1945;2:251–2.
. Mechanical suffocation during infancy. J Pediatr 1945;26:572–5.
. Sudden death or alleged accidental suffocation in babies. Med J Aust 1950;I:65–72.
. Statistical methods in medical research. 2nd edn. Oxford: Blackwell Scientific, 1990:462–5. The Nordic Cochrane Centre. Review Manager (RevMan). Version 4.2 for Windows. Copenhagen: The Nordic Cochrane Centre, The Cochrane Collaboration, 2003.
. An epidemiological and sociological study of unexpected death in infancy in nine areas of southern England. Med Sci Law 1981;21(2):78–88.
. Sleeping position and infant bedding may predispose to hyperthermia and the sudden infant death syndrome. Lancet 1989;1(8631):199–201.
. Sudden infant death syndrome related to climate. Acta Paediatr Scand 1991;80:278–87.
. 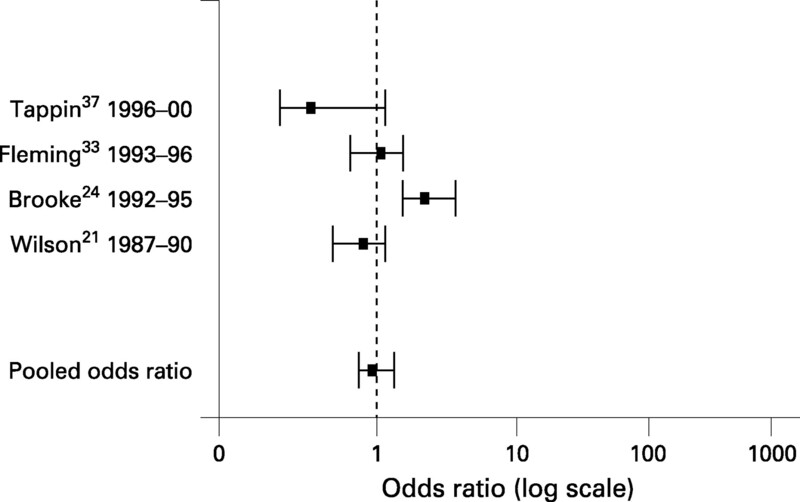 Combined effect of infection and heavy wrapping on the risk of sudden unexpected infant death. Arch Dis Child 1992;67(2):171–7.
. Sudden infant death with external airways covered: case-comparison study of 206 deaths in the United States. Arch Pediatr Adolesc Med 1998;152(6):540–7.
. Changes in the epidemiological pattern of sudden infant death syndrome in southeast Norway, 1984–1998: implications for future prevention and research. Arch Dis Child 2001;85(2):108–15.
. Association between sudden infant death syndrome and prone sleep position, bed sharing, and sleeping outside an infant crib in Alaska. Pediatrics 2001;108(4):923–7.
. Bedsharing, roomsharing, and sudden infant death syndrome in Scotland: a case-control study. J Pediatr 2005;147(1):32–7.
. Sudden and unexpected infant death II. Result of medico-legal autopsies of 356 infants aged 0–2 years. Acta Med Leg Soc (Liege) 1956;9:133–59.
. Death scene investigation in sudden infant death. N Engl J Med 1986;315:100–5.
. Cot death in the Netherlands. An epidemiology study. Amsterdam: VU University Press, 1991.
. Child care practices and the sudden infant death syndrome. Aust Paediatr J 1989;25(4):202–4.
. Clothing and bedding and its relevance to sudden infant death syndrome: further results from the New Zealand Cot Death Study. J Paediatr Child Health 1994;30(6):506–12.
. Contemporary risk factors for sudden infant death in an Irish population--a case control study. Ir J Med Sci 1992;161(5):131–4.
. Accidental death or sudden infant death syndrome. J Paediatr Child Health 1995;31:269–71.
. Case-control study of sudden infant death syndrome in Scotland, 1992–5. BMJ 1997;314(7093):1516–20.
. Abandoning prone sleeping: effect on the risk of sudden infant death syndrome. J Pediatr 1998;132(2):340–3.
. Role of infection, suffocation, and bottle-feeding in cot death. An analysis of some factors in the histories of 110 cases and their controls. Br J Prev Soc Med 1965;19:1–7.
. Body and head position, covering of the head by bedding and risk of sudden infant death (SID). Int J Legal Med 1998;112:22–6.
. Sleeping position and sudden infant death syndrome (SIDS): effect of an intervention programme to avoid prone sleeping. Acta Paediatr 1995;84:375–8.
. Interactions of infectious symptoms and modifiable risk factors in sudden infant death syndrome. The Nordic Epidemiological SIDS study. Acta Paediatr 1999;88:521–7.
. Sudden unexplained infant death in 20 regions in Europe: case control study. Lancet 2004;363:185–91.
. Epidemiological features of sudden infant death after a German intervention campaign in 1992. Eur J Pediatr 1997;156(8):655–60. , eds. Sudden unexpected death in infancy. The CESDI SUDI studies. London: Stationery Office, 2000.
. Sleep environment and the risk of sudden infant death syndrome in an urban population: the Chicago Infant Mortality Study. Pediatrics 2003;111:1207–14.
. Risk and preventive factors for cot death in The Netherlands, a low-incidence country. 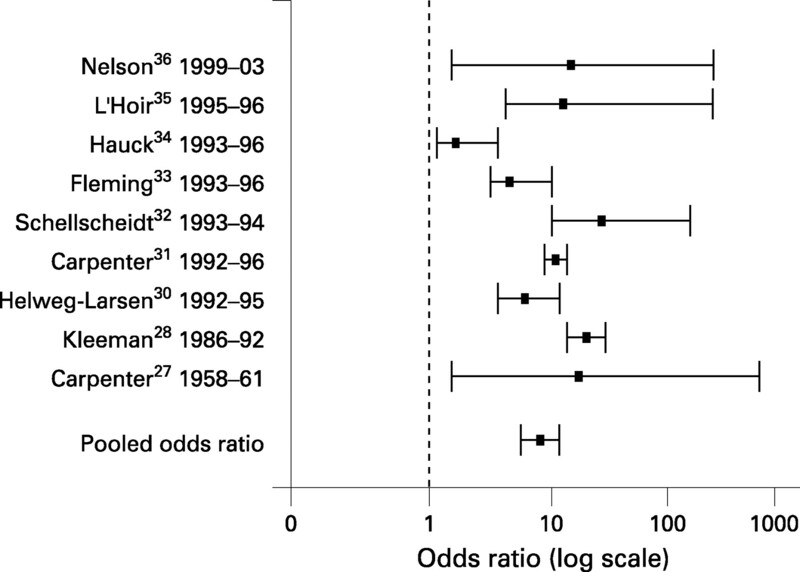 Eur J Pediatr 1998;157(8):681–8.
. Hong Kong case-control study of sudden unexpected infant death. N Z Med J 2005;118(1227):U1788.
. Used infant mattresses and sudden infant death syndrome in Scotland: case-control study. BMJ 2002;325:1007.
. Sudden infant deaths: stress, arousal and SIDS. Early Hum Dev 2003;75(Suppl):S147–66.
. Cardiorespiratory recordings from infants dying suddenly and unexpectedly at home. Pediatrics 1994;93:44−49.
. Gasping and other cardiorespiratory patterns during sudden infant death. Pediatr Res 1999;45:350−4.
. Characterization of successful and failed autoresuscitation in human infants, including those dying of SIDS. Pediatr Pulmonol 2003;36:113−122.
. Differences in infant and parent behaviours during routine bed sharing compared with cot sleeping in the home setting. 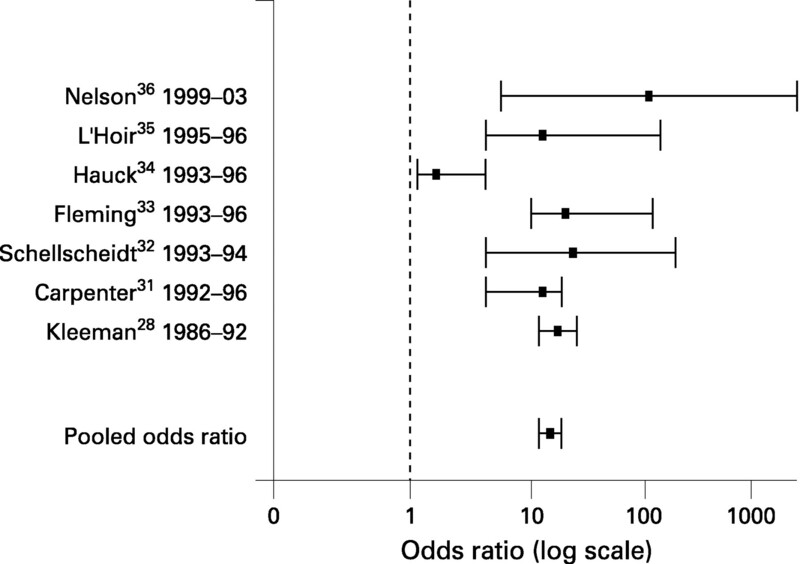 Pediatrics 2006;117:1599–1607.
. Major changes in the epidemiology of sudden infant death syndrome: a 20 year population based study of all unexpected deaths in infancy. Lancet 2006;367(9507):314–19.
. Sudden infant death syndrome in South Australia 1968–97. Part 1. Changes over time. J Paediatr Child Health 2000;36:540–7.
. Sudden infant death syndrome: risk factors for infants found face down differ from other SIDS cases. J Pediatr 2006;149(5):630–3.
. Influence of sleep position experience on ability of prone-sleeping infants to escape from asphyxiating microenvironments by changing head position. Pediatrics 2004;114:1634–9.
. Consequences of getting the head covered during sleep in infancy. Pediatrics 1997;100(2):E6.
. Babies sleeping with parents: case-control study of factors influencing the risk of the sudden infant death syndrome. CESDI SUDI research group. BMJ 1999;319(7223):1457–61.
. Sudden infant death syndrome and the time of death: factors associated with night-time and day-time deaths. Int J Epidemiol 2006;35(6):1563–9.
. Sleeping position of infants and the sudden infant death syndrome. Acta Paediatr Suppl 1993;82(Suppl 389):26–30.
. Smoking and sudden infant death syndrome. Rev Environ Health 2006;21:81–103.
. Side sleeping position and bed sharing in the sudden infant death syndrome. Ann Med 1998;30(4):345–9.
. The role of breastfeeding in sudden infant death syndrome. J Hum Lact 2000;16(1):13–20.
. Do pacifiers reduce the risk of sudden infant death syndrome? A meta-analysis. Pediatrics 2005;116(5):e716–23.
. Sudden infant death syndrome. Old causes rediscovered? N Engl J Med 1986;315(2):126–8.
. Resistance to airflow through bedding materials used in infancy. Arch Dis Child 1981;57:443–6.
. Are bedding and rebreathing suffocation a cause of SIDS. Pediatr Pulmonol 1996;22:335–41.
. Sudden death in infants sleeping on polystyrene-filled cushions. N Engl J Med 1991;324:1858–64.
. A sleep position-dependent mechanism for infant death on sheepskins. Am J Dis Child 1994;147:642–6.
. Physical properties of bedding that may increase risk of sudden infant death syndrome in prone-sleeping infants. Pediatr Res 1994;36(1 Pt 1):7–11.
. Carbon dioxide concentrations in the environment of sleeping infants. J Paediatr Child Health 1994;30:45–9.
. Some epidemiology factors about SIDS in South Australia. In: Tildon J T, Roeder L M, Steinschneider A, eds. Sudden infant death syndrome. New York: Academic Press, 1983:15–28.
. Prospective study on the prevalence of sudden infant death and possible risk factors in Brussels: preliminary results (1987–1988). Eur J Pediatr 1990;149:284–6.
. Interaction between bedding and sleeping position in the sudden infant death syndrome: a population based case-control study. BMJ 1990;301(6743):85–9.
. Development of thermoregulation in infancy: possible implications for SIDS. J Clin Pathol 1992;45(Suppl):17–19.
. Influence of ambient temperature on sleep characteristics and autonomic nervous control in healthy infants. Sleep 2000;23:401–7. American Academy of Pediatrics. Task Force on Infant Sleep Position and Sudden Infant Death Syndrome 2000: changing concepts of sudden infant death syndrome: implications for infant sleeping environment and sleep position. Pediatrics 2000;105:650–6.
. Recommendations for sudden infant death syndrome prevention: a discussion document. Arch Dis Child 2007;92:155–9.